Ahh, I can’t believe I haven’t included this manga on this site sooner! It is such a good series! I originally saw this series at my local bookstore a few months ago, but I never picked it up because at the time there were already 5 volumes out, and I was sort of reluctant to start a series that would require that much of a financial investment. However, this manga kept calling out to me 🙂 The covers are so cute, and over time, it seemed to be getting more and more popular. The bookstore eventually ended up setting up a large display devoted to the series! My resistance was weak, and I finally picked up the first volume. All I can say is that I am sorry that I didn’t get it sooner. It is so cute! I feel affection for this sort of like the affection I feel for Koukou Debut. The art in this series is cute, and can vary wildly. There are some scenes that look rather scratchy and scribbly, while others are very pretty. The main character, Sawako, is often shown in a very cute cartoony way. So adorable! This is the story of yet another high school outcast. I guess you can say it is sort of similar to another recent series I talk about Koko ni Iru yo! except that the heroine in this is not quite as pathetic 🙂 The story revolves around KURONUMA Sawako, a girl who has a great deal of trouble expressing how she feels in both her face and manner. Her looks are so dramatic, with her long pitch-black hair and fair skin, that she resembles the frightening girl “Sadako” from horror movies. Thus, “Sadako” is her nickname, and few people in her class can remember what her real name is. Everyone in her class is afraid of her and they spread horrible rumors and gossip about her, such as stuff like how she can talk to ghosts or she can curse you. Unfortunately for Sawako, because of her shy nature, she had a very difficult time dispelling the horrible rumors or telling people that she really isn’t someone they should be afraid of. Sawako is a very adorable character. Instead of isolating herself, she tries harder to be friendly. All she wants to do is help everyone and be useful and to make people happy. She doesn’t feel bad about all the horrible things people say about her, and has no hard feelings. She is used to it, and tries to be better, but she has been unable to make everyone around her understand her. Her personality is amazingly cheerful and optimistic, considering her circumstances, and she never gives up trying to be friendly to everyone. Sawako’s situation is a stark contrast to a boy in her class, Kazehaya. He bright, cheerful, and popular. Everyone is drawn to him, and he is friends with everyone. More importantly, he is the only one who is friendly to Sawako, and treats her just like he treats everyone else. Because of this, Sawako respects him so much and admires him from afar. She considers him to be “refreshing” and she wants to be just like him- someone who is easily able to open up and make a lot of friends. The story follows Sawako as she struggles to be friendly (her face looks frightening no matter what expression she tries) and starts to become closer to the easy-going Kazehaya. Thanks to his help, she is slowly able to open up and make her feelings known. Kazehaya’s influence and assistance mean a lot to Sawako. She is finally able to make a friend or two, and to express herself, though the rumors persist. And what of her relationship with Kazuhaya? Could he possibly like Sawako? It seems like he might, but Sawako is so clueless, she just can’t imagine it! I ADORE this manga. It’s one of the sweetest, purest love stories I’ve ever read. Good call! I absolutely LOVE this manga as well. I think the mangaka is VERY tallented. the characters are great, and the illustrations are stunning. there is a good level of sarcasm, adding onto the great story. this manga is really something different. 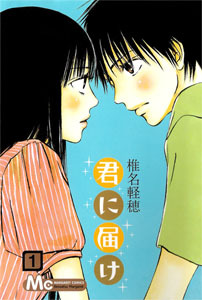 i think Kimi Ni Todoke might even reach the top of my shoujo manga list by the middle/end of the story. so far, i have only found chapters 0 to 3, and am looking forward to the rest. DOES ANYONE KNOW WHERE I CAN BUY THIS MANGA (in English)? i live in Mississauga, Ontario, Canada. if anyone knows i can buy this manga in English from downtown TORONTO, pleeeeeeeease let me know. i LOVE this manga! i couldnt find any chapters online after chapter 3. SO IF YOU KNOW WHERE I CAN FIND (library/online) THIS MANGA, OR BUY THIS MANGA FROM, PLEEEEEEEASE LET ME KNOW. but please, let me know. i wish to buy this manga, in support of the mangaka. Well, I’m a year late but Anime News Network the manga will be distributed in English officially in July by Viz so just wait a bit longer. Even though Shiina-san is currently on maternity leave the manga is being turned into a drama and there will be an anime in the fall. hey there! first time commenting (although been visiting this site since the beginning of this year) i just love this site! thanks alot for sharing all the wonderful manga for us viewer to see! it is through this site that i was able to find really good manga to read and by far this is one of the best manga i read so far! i love the characters development the author has created! wish they would hurry up and translate the series!!!! gahh just wish i could read japanese. so so jealous that the japanese manga is already out while we have to wait for the english version. but i vow to myself that i will race to the bookstore and grab this book once it is out!!! !